As we turn to bask in the full glow of the summer sun, mornings begin to heat up quickly and as they heat they become quieter. The Neotropical migrants that arrive in waves in April and early May filling forests, glades, parks and backyards with the lustful music of birdsong have paired and are busy setting up housekeeping; territories have been established and populations are more diffuse. Males still greet the dawn with song as they patrol their territory stopping at the same established song posts to give a shout out, letting other males of the same species know, “this spot is taken.” After the morning tour of duty, assured that his territory is secure the male turns his attention to whatever fatherly duties are at hand, be it nest building, securing food for mates and/or young, etc. They still sing occasionally but it’s not as urgent or prevalent as when they were looking for a mate. And as the morning heats up song becomes more and more scarce. Forests can become deathly quiet by 11 a.m. on a late June – July morning. But if you know nature, you know there are exceptions. 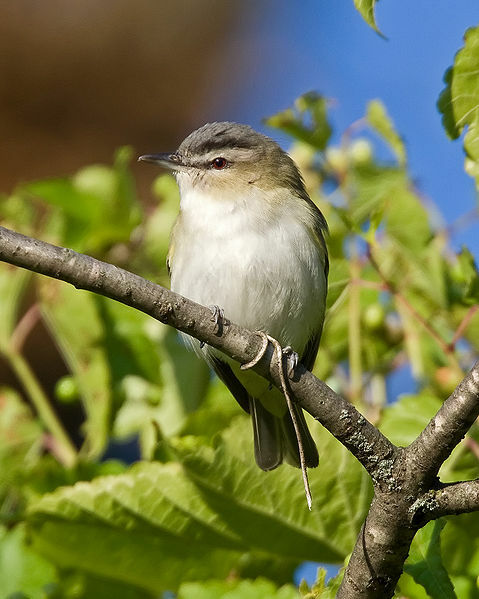 The red-eyed vireo is a prolific songster. Granted the short robin-like phrases repeated again and again as often as 40 times per minute are not as melodious as songs from other Neotropical crooners but often, on those hot summer days, they will be the only tune blaring from the treetops in the midday heat. Consider the vocal output of this arboreal rapper. Sources vary considerably regarding the number of songs a red-eyed vireo might sing in a single day. The estimates range from 10,000 to 20,000. Taking the smaller estimate and figuring on an average of 15 hours (900 minutes) of daylight during the red-eyed vireo’s stay on its nesting grounds and this little songster is belting out 11 songs per minute; takes whistle while you work to a whole new level. The red-eyed vireo is one of the most common Neotropical nesters in North America. It ranges across Canada, drops down through British Columbia to Oregon and parts of Colorado and across the entire Eastern U.S. down to the Gulf States. Not a blaze of color but an attractive, dapper bird about six inches long. The sexes are similar with the male being a bit brighter. They are olive-brown above with the tail and wings darker than the nape and back. It has a prominent white eye stripe with a black border at the top and a gray cap. The under parts are creamy white. Red-eyed vireos build cup-like nests suspended from forked branches, generally below 20 feet. The nest is constructed of twigs, bark, grasses, pine needles (if available) and lichens. Spider webbing is used to hold the nest together and the inside is lined with plant fibers and/or hair. Red-eyed vireos are common interior forest nesters but spill over into edges and suburban settings. These more open nests are prone to parasitism by brown-headed cowbirds. A dedicated insectivore during summer often hovering to pluck caterpillars and other insects from twigs and leaves (85 percent of its summer diet is insects) the red-eyed vireo often shifts gears and becomes totally frugivorous on its wintering grounds in the Amazon Basin. Now I don’t know who decides these things, perhaps in this case someone who had one too many libations the night before – but a group of red-eyed vireos is known as a “hangover” of vireos.